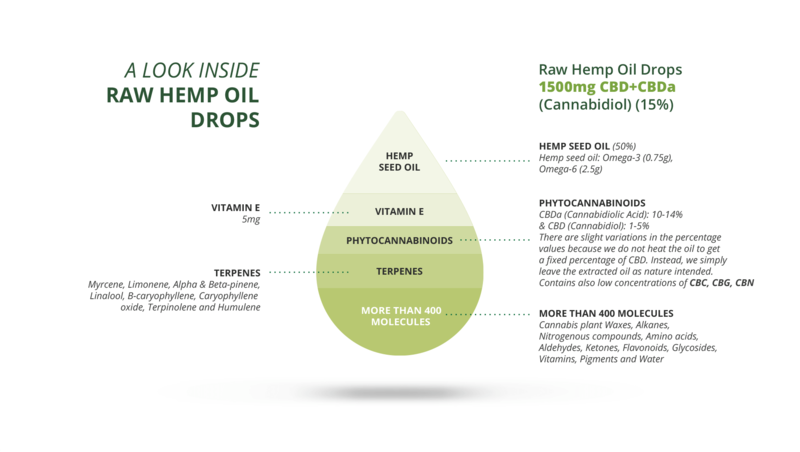 1 drop contains 5mg CBD+CBDa. Organic Raw Hemp Oil is created using very low temperature and high pressure. In essence, it’s the ‘juicing’ of the hemp plants, which forms a concentrated, superfood supplement. The oil has unique properties because it contains CBD (cannabidiol) in a carboxylic acid form, known as CBDa also called CBD Acid. Safe for your cat or dog. Our customers want to be sure what they get is what they see on the label. By employing pharmaceutical standard control and rigorous laboratory testing, we ensure consistent potency and purity in every bottle. We are constantly striving to improve our production methods, employing a team of scientists, herbalists and nutritionists who formulate our organic hemp oil extracts to the highest standards of good manufacturing practices.